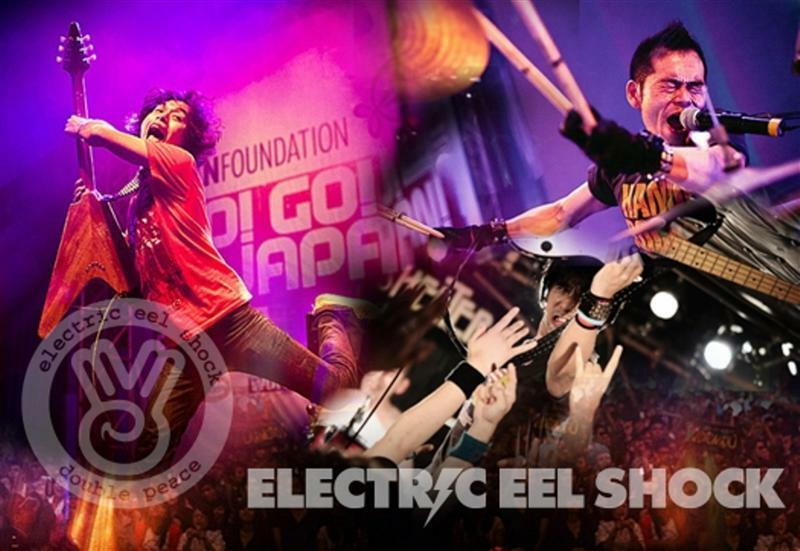 Electric Eel Shock are a glorious celebration of Classic Rock, Punk and Metal. A true power trio from the time before rock became fractured into a diverse multitude of sub-genres and we were all still one big happy Rock & Roll family. EES left their native Japan in 1999 to see what they could make of America and they have been on a near constant world tour ever since. EES paid their way by selling merchandise and their self recorded album "SLAYERS BAY BLUES" at their gigs. Headlining a stage at the prestigious Roskilde Festival in Denmark was a key early event for the band. By 2004 EES had toured 27 countries around the world and they decided it was about time to release an album: "GO EUROPE!" became the first commercially available EES release and the band performed at 30 European Summer Festivals. Follow up album "BEAT ME" was recorded in Holland early 2005 with legendary producer Attie Bauw (Judas Priest, Scorpions, Bootsy Collins etc). BEAT ME achieved much critical acclaim from press and fans alike and EES continued to conquer the international musical scene step by step throughout 2005 and 2006 adding Australia and parts of Asia to their widening travels. In 2007 Electric Eel Shock again worked with Attie Bauw on a new album: "TRANSWORLD ULTRA ROCK" is an amazing collective work that seems to span the EES back catalogue, including the raw inventiveness of Slayers Bay Blues, the catchy songs of the GO albums and the hard tight rock of Beat Me. This album has it all. The overall atmosphere is more positive than ever before. It’s a feeling that reflects the Shock’s ongoing progression, from playing every dive bar and toilet around the world to selling out larger more prestigious venues. Electric Eel Shock are a band who’ve worked hard to get where they are - and they’re damn well going to enjoy themselves! Of course, everyone - fans old and new - are invited to join the party!